Successor to the Philosophical Journal. Crystola, CA, and from February 1908 in Langdon, CO. Publisher: Crystola Publishing Co.. Editor: George B. Lang. 1/1 June 1906-2/12 May 1908. $1.00/year. Illustrated with photographs of J.M. Peebles, Henry Wagner, et al. 6 x 10, c. 36 pp. 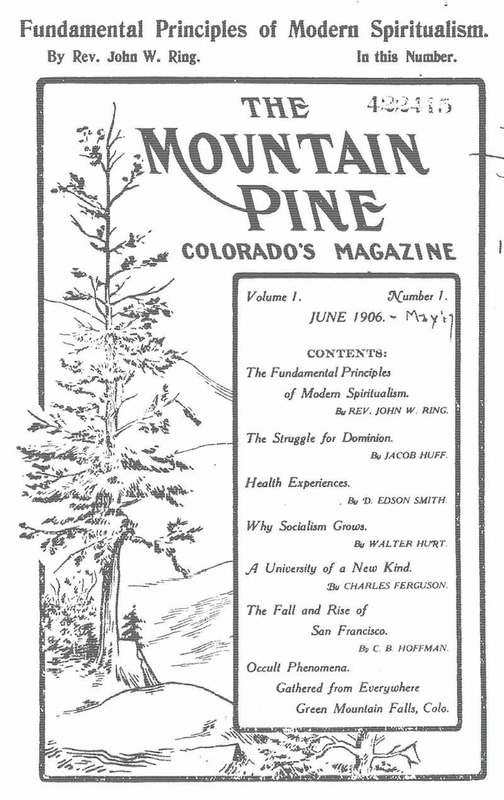 This is the last gasp of the once-mighty Religio-Philosophical Journal, reduced in its old age to New Thought, fringe health advice, the "higher socialism" and long disquisitions throughout 1907-1908 by Dr. Henry Wagner of the H.B. of L. It functioned as a vehicle for the Crystola Camp and land-development in Green Mountain Falls, Colorado (near Pikes Peak and Ute Pass). In its last months devoted almost exclusively (except for Wagner's continuing series on "The Religion of Nature" and "The New Man") to cowboy stories and to tales of adventure and exploration in Africa. NYPL.